It looks like Apple released a new 10.13.6 Supplemental Update for us early adopters of the Mid 2018 MacBook Pro. Any idea what this patch does and/or if it is safe to update or not? @garcia_cesar reapply patches in macOS. Needs to be done after every update. The second supplemental update was to fix T2-based kernel panics and audio driver issues in MacOS, and to apply the thermal management fixes from the previous update to bootcamp. I can now get optimal performance in bootcamp in cpu intensive apps without having to set thermal limits in XTU. @ningauble77 oh wow, that is incredible news! I've been running my CPU at 90% Max Performance in the Power Plan Settings in order to avoid Thermal Throttling. I'm excited to see the results in Bootcamp after this update. @ningauble77 Can confirm this myself on a 2018 15" MBP 2.6G. Cores are throttled still via firmware per logs, but not by a lot (seen 4.1GHz on all cores via HWiNFO64 sometimes). I too have this same problem, could you explain what you mean by "reapply patches"? I've tried running macos-egpu.sh again but get the same error all the time: "A system file (wrangler), has been replaced and does not fit to the system. You must revert those changes in order to continue. You can also upgrade to the latest supported release or reinstall macOS." I figured purge wrangler was something i needed to do so i ran that and it made no difference, could anyone provide some instructions? When you update the OS, any patches made using scripts are undone. So for whatever script you used, reinstall the patches by following the instructions for that script. Don't mix scripts - stick to one. If you want to start with a clean system, just reinstall macOS on top of your existing installation. could you write up a tutorial on how to reinstall the patches. Did anyone get this figured out? I see the instructions to run the patch again but there seems to be some confusion on how to do that and not sure if it fixed the issue yet. Anyone have any success? yeah the purge-wrangler menu is not working for me. You can only install this. If you try and install two different solutions it will not work. I used to use Fr34ks script because it was a simple one size fits all route but it was pretty unstable for me in various scenarios. Purge Wrangler has given me the most luck. Try it out. This probably means you're going to have to format your MBP install all updates and then install Purge Wrangler. You could do it out of order: Format, Install Purge Wrangler, Install Updates. But then you'll need to reinstall Purge Wrangler after the update completes to make the script functional again. This has always been the case after any software updates. The key seams to be not to mix solutions--and use Purge Wrangler. EFI solution should be easier. you are a genius!!! this one works!!! THANK YOU!!!!!!!! I used the purg wrangler route. Which installed the 387.10.10.10.40.105. 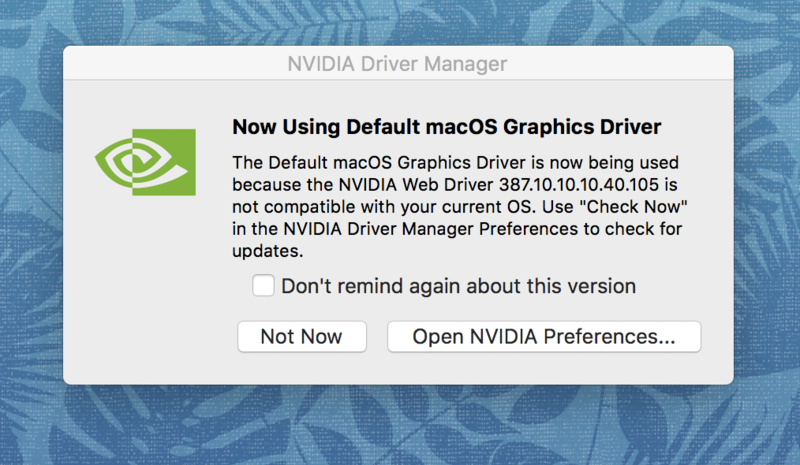 Do I need to update the driver or install a different version? @danmeyerphoto That script will also install the same driver, as the 17G2307 version was pulled I think (I tried on Mojave and the 17G65 version was recommended - the script I believe recommends the latest available for a beta). If the purge-wrangler menu does not work for whatever reason, re-use the long command on the forum. @mac_editor so just to clarify I should uninstall the script via purge wrangler menu. And perform fresh resintall of the script from scratch? Or can I just reinstall the original script over what is already there? @danmeyerphoto The script will automatically overwrite what's necessary, no worries. Just run the long command and it should fix the menu issue for future use. For your setup, I'd recommending doing the system recovery and removing all modded components and web drivers. Then try again with Option #2. Update: The purge-wrangler script install works now after an update. It did not work I got the same result. I follow this protocol and it worked, success! I am not sure why it worked but I thought it may bring to light a new issue to look at with the coding perhaps. Thanks for your help though. You're doing a great service of helping so many users. Much appreciation!! I had this method working perfectly if a 2018 15” MacBook Pro, Sonnet 650 and 1080ti... until the second 2018 supplemental update which broke the method. Is there a known solution for users with 2018 MacBook Pro’s? The script seems to work perfectly and patches the Nvidia drivers, just no recognition from the system that the card is connected. If this required sip to be disabled... "not sure" if so.. maybe the update turned that back on? Remove any patches that you have installed, reboot, and reinstall your patches. I've had really good success with Pure-Wrangler https://egpu.io/forums/mac-setup/script-enable-egpu-on-tb1-2-macs-on-macos-10-13-4/ more so than fr34k when it comes to 10.13.4, but that is most likely due to my lack of understanding. TLDR; Erase the old and use Pure-Wrangler. 2018 MacBook works. Yea, that's the strange thing - once the Supplemental patch happened I knew to turn SIP back off and to reapply Purge-Wrangler, but it's still a no go. I thought that this was maybe a quirk of the Supplemental update and there was another tweak that 2018 owners needed to make but seems not? Maybe the update to Mojave once the web drivers are released will see things work again? I managed to get things working on my mid 2018 i9 - used Benjiman's Nvidia installer.. it put in 105... wrong for this os but still patched it happily. then ran purge-wrangler - I doubt I have qi/qe on ext monitors on eGPU - 4k TV was janky as hell. but CUDA is happy and both v-ray and octane benchmarks are. about right for a single 1080 card. aorus gaming box. - had to reboot then remote in the first time to set the monitors not to mirror got rid of black screen and logged out logged in.. rebooted long as its in its working... AMD for screen drawing and CUDA on ext eGPU for rendering.,.. my use case is happy - Normal boot login / logoff / connect applies - ONLY ODD THING - My trackpad does not work when eGPU is connected..Anyone have an idea why that is? update - seems the CUDA stuff is working brilliantly.. - however the internal trackpad was an easy fix but still wondering why its happening? Firmware maybe on the aorus box? - the setting for ignore trackpad when mouse is present was on in accessibility. turn that off and both external mouse / pen tablet work fine.. but even if I unhook the tablet.. once I connect the eGPU aorus 1080 box.. it still doesn't bring it back.. but if I turn off the setting in accessibility both work.